Black Diamond Helio Gloves. 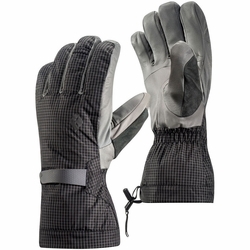 A lightweight, three-in-one glove system designed for weight-conscious ski mountaineers and alpinists, the Helio Gloves provide serious versatility for serious alpine objectives. The ultimate three-in-one glove system for weight-conscious alpine pursuits, the Black Diamond Helio Gloves provide versatile protection across a range of weather conditions. The Helio’s insulated, waterproof shell layer features a GORE-TEX insert + Gore Active Technology, PrimaLoft Gold insulation and an ultralight Dyneema ripstop shell that keeps gnarly conditions at bay. The removable fleece liner glove features a weather-resistant softshell backer and grippy palm for lightweight, highly breathable protection on steep approach slopes and skin tracks. When conditions are cold, wet and just plain bad, the two layers combine for increased warmth and protection, while remaining highly dexterous for handling ropes, boot buckles and other gear.